The first time I went to America, I was 16 years old. Following a last minute decision, I was allowed to tag along with my parents who were going as part of an official trip to various parts of the country. We travelled right from New York to Syracuse, to Chicago, followed by Washington DC and finally to San Francisco. As someone who had never been to America before, this was a neat deal. Having heard so much about New York University from seniors and friends at school, I went to see NYU on my first day in New York. I followed this up by making sure I visited college campuses in every city I could- I subsequently visited Syracuse, Georgetown, Berkeley and Stanford University as well. I found myself quickly being attracted to the American education system: the Socratic method of teaching that is very commonly employed in America appealed to me deeply. I came from a very structured education system: where the concept of liberal arts was still both relatively misunderstood and new. America gave me the opportunity to study everything at once: I met philosophy majors taking an art class math majors with a focus in music. Two years later, when my parents asked me which university I was considering in Delhi: I hesitantly replied,-“America.” Nervous glances were exchanged, and finances were explained. We reached a deal that if I could find myself a scholarship or financial aid then I could potentially go. I chose a liberal arts school, Mount Holyoke College. An unconventional choice for some, it was my dream school. The founding member of a seven sister college during the 1800s, Mount Holyoke disseminated the radical idea that women too, deserve an education. With SAT scores submitted, and FAFSA forms filled out, I waited with baited breath. March arrived and brought with it an acceptance letter and a letter detailing the financial package I had received essentially handing me my dream. After the process of nervously filling out visa applications and being granted my visa, I landed at Boston Logan airport and went onward to Mount Holyoke College. A world on its own, Mount Holyoke became the most challenging and enriching experience I have ever had. I was challenged by professors in classrooms and corridors, to justify, to argue and to ultimately, grow. I met people from parts of the world I knew nothing about: immigrants like myself. I learned about cities and cafes and lanes in Iran, in Pakistan, in Morocco. I unlearned inherent biases I was taught in the society I came from: about sexuality, gender, religion, and politics. But moving to a new country always entails more than just academic and intellectual fulfillment. I learned to live in a new culture, where dinner was at 7pm and it was salad and pasta, not the roti and dal I took for granted at home miles away. I slowly understood what “freshman/ orientation,” friends were. People I had gone to orientation events and pizza nights with slowly became classmates and people I said hello to every day before my coffee run. This all began an unsettling phase for me which is also popularly termed as the “culture shock,” phase in America. It is preceded by the “honeymoon phase,” when you love absolutely everything about moving to the United States and put up five posts on social media exclaiming how happy you are. After the “honeymoon phase” is when the “culture shock” phase sets in. It is the realization that you are far away from home in a world that doesn’t celebrate Diwali or Eid. While it is important to understand that this is something everybody goes through, this is when the feeling of second guessing yourself can set in. I asked myself (and my advisor) whether I really belonged at Mount Holyoke: my peers seemed more capable and more intelligent than I did. He laughed and told me that I had now completed the circle of being a first year student. A couple of weeks later at an event for first year students, the dean of our college described this exact feeling, detailing how many first years had walked into her office with the same feeling of self-doubt. I breathed out knowing I wasn’t alone. The dean suggested getting involved in activities that would help one better understand American culture whether it was fall themed events and fairs or attending a soccer game. It was the realization that I had the opportunity to understand and embrace another culture without giving up my own which then allowed me to begin to feel at home in another country. The first time I heard of apple picking, it sounded like a strange concept to me: you spent a couple of hours picking apples and then got to eat them. It didn’t sound terribly exciting at the time, but it was! And it was not just the process, but also the experience of meeting local farmers who have been doing this for decades and to understand why they celebrated the idea of apple picking as an activity too. The next big event that is heavily celebrated in America is Halloween. Coming from a relatively big city in India (Bangalore) I knew people who celebrated Halloween and went trick-or-treating in my home city, but it was still an elite phenomenon which involved resources and access to information about the intricacies of a holiday in America that I didn’t have. However, in America – the coming of 31st October was everywhere! From pumpkin carving events to on campus parties, everyone was talking about it! Eventually, curiosity got the best of me and I too decided that I wanted in but not until it was almost too late! 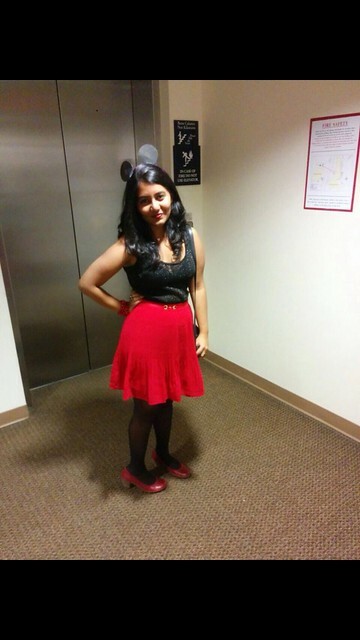 For my first Halloween, I ended up on google trying to find the easiest DIY Halloween outfit I could put together quickly and ended up with “Minnie Mouse,” one of the most popular and easily one of the most overdone Halloween outfits on any college campus in America. I ended up going to an Icona Pop concert that evening followed by a midnight breakfast hosted by our college! I often refer to this seemingly simplistic example of Halloween as it was this celebration that made me realize that integration was key to feeling at home in America: I had such a great time at this event and it was because I had felt part of a larger community for the first time after having moved to the United States. Another holiday that is widely celebrated in America is Thanksgiving. It originated as a harvest festival and was officially established as a national holiday by Abraham Lincoln in 1863 at the height of the civil war. More than the initial religious connotations, Thanksgiving has evolved into a festival where Americans come together as a family and cook and share a meal as a family. Almost all Americans end up eating a Turkey – either roasted, deep fried or baked. According to a survey by the National Turkey Federation, almost 90% of Americans eat a Turkey for Thanksgiving. I give these statistics not just as fun facts but also to reiterate how big an event Thanksgiving is to Americans today. For my second Thanksgiving in America, I spent the holiday with close family friends, and ended up having a lot of traditional dishes (that my hosts graciously made!) and it is one of my most treasured memories of America as it taught me the importance of having friends and family in a new country. In contrast, I celebrated my first Diwali (the Hindu festival of lights) away from home during my first year in America which was on a gloomy fall day in October and classes were on as usual in contrast with my native country where we had almost a week off to bring in the festival with cheer and joy. This was a tough experience as all I wanted was to be at home, decorating my home, distributing sweets, and celebrating the festival most important to me. Over a conversation with my family on FaceTime, my mom reminded me that I now referred to Mount Holyoke as home. Following this, she said that I should celebrate Diwali at my new home too. I decided that she made sense and went on to decorate my little dorm room and participate in the Diwali celebrations on campus hosted by the South Asian Students Association. Not only did I end up having a truly memorable Diwali, I also ended up ended on the board of the South Asians Students Association soon after. 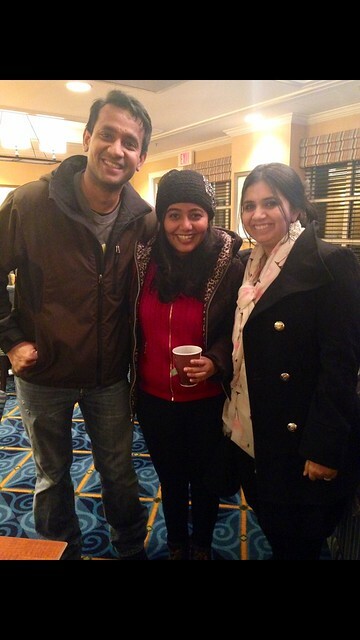 I had realized, I could celebrate Halloween as well as celebrate Diwali and still feel at home in America. In the end, the goal of cultural adjustment is cultural assimilation but I see assimilation as understanding and enjoying the cultural practices of a host country while also retaining your own. It was through an amalgamation of family, friends and surrounding myself with the right noise (the right kind of art, music, films, and travel) that I began to feel at home in America. Americans, typically, are very friendly, so respond to their “hello, how are you?” and see what can happen! As for me, I am excitedly looking forward to going back to America for my senior year.